Professional hit-man Léon (Jean Reno) takes in a 12 year-old girl named Mathilda (Natalie Portman), whose family was recently murdered. He teaches her the tricks of his trade in order to help her get revenge. As time passes, the two grow close and form a very unlikely bond. Luc Besson's "Léon: The Professional" is an dramatic action thriller about a hit-man and a 12 year-old girl's unlikely relationship. 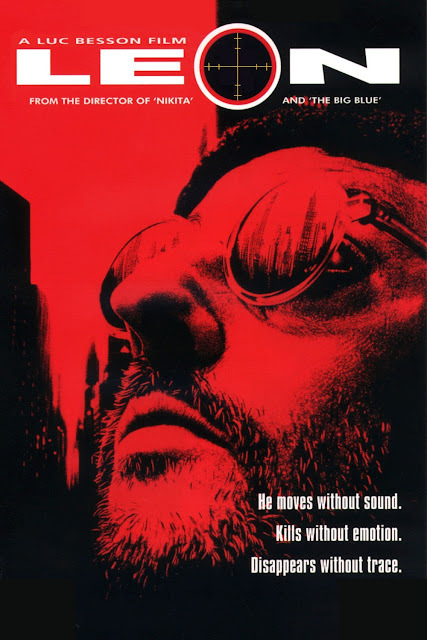 Jean Reno plays the titular Léon, who doesn't seem like the most emotionally mature or mentally developed person in the world. However, when it comes to killing people, he has a unique gift for it. He is essentially a murder savant. Léon lives in a run-down apartment complex, and just down the hall living with her family is a 12 year-old girl named Mathilda, played by a very young Natalie Portman in her feature film debut. After a dispute with a man named Stansfield, played by Gary Oldman, over some missing drugs, Mathilda's entire family is murdered, including her four year-old brother. Against his better judgment, Léon takes the girl in even though it means putting himself in danger. With initial hesitation, he also takes Mathilda under his wing and starts to teach her the hit-man game. Léon and Mathilda have a bit of an odd relationship, one that may make some viewers uneasy. There is definitely a romantic undertone to it as Mathilda seems to view Léon more amorously than fatherly. To combat the feelings that Léon is somehow taking advantage of Mathilda, Jean Reno does a brilliant job portraying the character like he has a diminutive capacity and the emotional maturity of someone closer to Mathilda's age despite the fact he is more than 30 years her senior. Reno is also very believable as a ruthless killer who is not to be trifled with, and we don't think he gets enough credit for his tremendous performance in this film. Natalie Portman also does an equally outstanding and convincing job, especially considering this was her debut role. Portman is able to convey a whole myriad of emotions, as well as displaying a maturity and ability far beyond her years. Of course, these two antiheroes need their antagonist, and that comes in the form of Gary Oldman's crooked cop Stansfield. Oldman has an amazing ability to go from somber to psychopath in 0.345572 seconds, making him the perfect choice for villainous roles of this type. "Léon: The Professional" is a film with strong emotion and even some darkly humorous comedy, as well as outstanding action scenes and a simple but well implemented premise of revenge, devotion, and friendship. For those who haven't seen it, this is a classic absolutely worth checking out at least once. Absolutely one of my favorite movies!